oh, the places we went (in 2014)! 2014 MARKED THE START OF THIS ADVENTURE, AND WHAT A RIDE IT'S BEEN! We were all over Washington this year, with forays into Oregon and Idaho, with the bulk of our days spent on the trail - at trail races, gathering intel for future endeavors, doing trail work, or simply learning what opportunities exist for sustainable trail education across this great state. 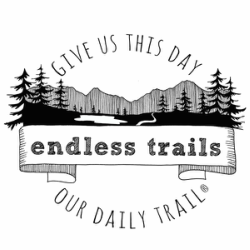 We can tell you we have lists upon lists of trails we want to see, trails we want to play on, and trails we want to help improve. We can also tell you that we know we're not the only ones who love trails. If you have a favorite trail you love, we'd love to hear about it. If you have a trail you'd love to help us advocate for, or work on, we'd love to hear that, too. We have plenty of dates and locations listed below where we went in 2014 - and that was just our first full year! OH, AND ABOUT THAT TRAIL WORK? 2014 was the year of doing trail work as we've found opportunity, as we were on the trail, as we saw the need. Each year, we are better prepared, with more opportunities for you to join us. If you want to know about more trail work opportunities, just let us know, or use the contact form below! If you'd like to meet up with us, sponsor any or all of the above-mentioned endeavors, or have any questions or comments, let us know. We'd love your input and support!